Safety and security are the most important requirements for all homes. In case you have moved into a new home and concern about your security or if your lock doesn't function properly, the best option is to get the lock replaced. Door lock replacements need to be done by a reliable and trusted locksmith to ensure the lock is installed securely and properly. Our locksmiths use damage-free techniques to handle all door lock replacements. Our services are 24/7 including weekends and public holidays. Get in touch with us and we will be there as fast as possible to help you with your request. 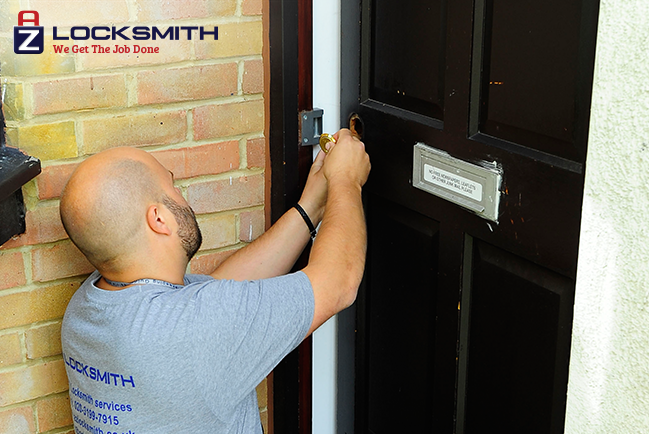 Do not risk the safety of your home, when you can find an affordable locksmith close to you. We are here to provide you with everything you need in terms of keeping your home in safe hands along with accurate and effective installations. Our efficient and reliable solutions offer the best rates in the industry making it very affordable. We have a 1-year guarantee for all our services and products and we offer the best value for your money in the industry. Depending on your specific requirements, at AZ Locksmith, our technicians can help you with any type of door lock replacement. In case of any uncertainty with choosing the right lock, we can provide you with the appropriate choices and advice for your home security. Our experts carry all the necessary tools to service you at your desired location and make sure it is completed to absolute perfection.